​Pinergy, the smart energy company, has today announced that it is providing 100 per cent of its electricity from renewable energy sources including wind, solar and hydro power. Pinergy, the smart energy company, has today announced that it is providing 100 per cent of its electricity from renewable energy sources including wind, solar and hydro power and will continue to do so. This development positions Pinergy as Ireland’s first and only specialist smart energy provider to now fully supply all of its electricity to its customers from renewable sources. 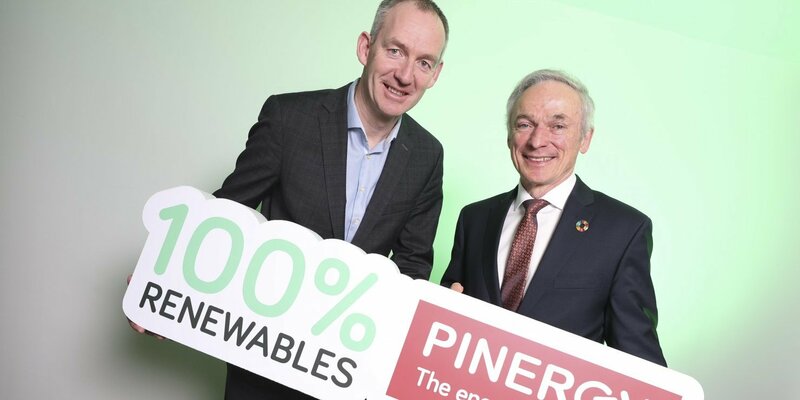 The announcement was made at the first in a series of ‘Sustainable Dublin 2050’ events hosted by Dublin Chamber and co-sponsored by Pinergy, at which the Minister for Communications, Climate Action & Environment, Richard Bruton was the keynote speaker. This latest move by Pinergy marks another important step in helping to reduce Ireland’s carbon footprint and will contribute significantly in supporting Pinergy’s business and residential customers wanting to play their role in creating a sustainable energy future. Ireland has committed to a target of 16 per cent of total energy from renewable sources by 2020 but is facing the prospect of millions of euros in fines if these targets are not met. The latest Renewable Energy in Ireland report published by the Sustainable Energy Authority of Ireland (SEAI) has found that just over 10 per cent of energy consumed in Ireland in 2017 came from renewables. Pinergy’s smart energy technology, comprising of Smart Meters and the Pinergy Smart technologies supports domestic and business customers to more easily monitor and track their energy usage, getting instant real-time visibility on energy costs. Through more active engagement and efficient usage in their energy consumption, many of Pinergy’s customers have enjoyed energy savings of over 20 per cent from switching to its smart based technology.